Edge CTMS is a cloud-based clinical trial management system (CTMS) designed to provide users with a robust platform that consists of powerful study management, payment, and monitoring modules. Each module can function individually or simultaneously, allowing users to make the system to adapt and work for them, instead of the other way around. Launched more than a decade ago, Edge CTMS smoothly integrates with Rave EDC to give users real-time views into the progress of their research without having to manually track the development or reconcile data. With Edge CTMS, visit reporting productivity is greatly improved by up to 40%, which in turn, brings down operational costs and enable monitors to focus on value-add activities. Edge CTMS presents you with a clinical trial management system that is highly configurable and easily adaptable to your existing workflows and processes. Its Cloud technology enables Edge CTMS to provide the same power and functionalities to organizations of all sizes, whether you are working for top 10 Pharmaceutical Companies to startups and CROs. It is so easy to set up and implement that users with little to no IT expertise can fully maximize the system. Edge CTMS boasts of simple configuration, allowing you to tailor Edge CTMS as per the unique requirements and specifications of your clinical research. Edge CTMS is built with agility in mind. Created based on Agile development methodology, Edge CTMS greatly accelerates your clinical research processes by fuelling the development of enhancements and then ensuring that said enhancements are delivered right into your hands. Keeping pace with your clinical research processes has never been easy. Edge CTMS is already integrated, which means you will never have to deal with expensive integrations or work with fragmented data. Featuring an open architecture, Edge CTMS smoothly exchanges data with other applications and systems—pre-populating data, triggering events and eliminating duplicate work. It even has a configurable link to Medidata’s Rave EDC right in the Medidata Clinical Cloud. If you are interested in Edge CTMS it could also be sensible to check out other subcategories of Best Clinical Trial Management Software collected in our base of SaaS software reviews. It's important to keep in mind that virtually no software in the Clinical Trial Management Software category will be an ideal solution able to match all the goals of all business types, sizes and industries. It may be a good idea to read a few Edge CTMS reviews first as some software might excel just in a very narrow set of applications or be created with a very specific industry in mind. Others might function with a goal of being easy and intuitive and consequently lack advanced features needed by more experienced users. You can also find software that support a large group of users and give you a complex feature base, but that usually comes at a more significant price of such a service. Be certain that you're aware of your needs so that you choose a software that offers specifically the functionalities you look for. How Much Does Edge CTMS Cost? Contact Medidata Solutions for more information about Edge CTMS, including basic and enterprise pricing information. We realize that when you make a decision to buy Clinical Trial Management Software it’s important not only to see how experts evaluate it in their reviews, but also to find out if the real people and companies that buy it are actually satisfied with the product. That’s why we’ve created our behavior-based Customer Satisfaction Algorithm™ that gathers customer reviews, comments and Edge CTMS reviews across a wide range of social media sites. The data is then presented in an easy to digest form showing how many people had positive and negative experience with Edge CTMS. With that information at hand you should be equipped to make an informed buying decision that you won’t regret. What are Edge CTMS pricing details? What integrations are available for Edge CTMS? Edge CTMS’s open architecture allows for seamless exchanges of information with other systems—pre-populating data, triggering events and eliminating duplicate work. 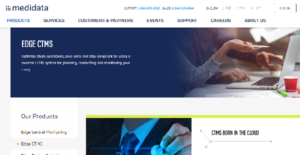 If you need more information about Edge CTMS or you simply have a question let us know what you need and we’ll forward your request directly to the vendor.